"It goes so fast. We don't have time to look at one another - oh, I didn't realize! So all that was going on - and we never noticed." 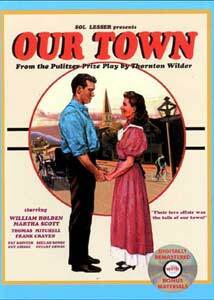 United Artists released the film of Our Town in 1940, based on Thornton Wilder's Pulitzer Prize-winning play about small-town life and death in Grover's Corners. For many years the movie was believed to have fallen into the public domain; it was a staple of Goodtimes Home Video's mass-market VHS videocassette line, available at K-Mart and its like in the days before sell-through pricing became available on major titles (starting with Paramount's Raiders of the Lost Ark.) The film was brought back under some degree of control when it was established that the original play's copyright was still in effect and might be used to prevent wanton distribution of the "derivative work" movie version (still available in multiple VHS editions at this writing.) Unfortunately, the film's tour as an "orphaned" work has allowed its condition and visibility to deteriorate; this DVD is the first major release the film has seen in some while. William Holden and Martha Scott star as young George Gibbs and Emily Webb, backed by a parade of great Hollywood character actors including Guy Kibbee, Beulah Bondi and Stuart Erwin. Frank Craven (who also worked on the screenplay with Wilder and Harry Chandlee) appears as the bucolic Narrator, framing this wide-ranging, essentially philosophical story with dry wit and calm observation. The movie retains a "stage" feel, with Craven addressing the camera directly, and one scene in which off-screen "audience" voices pose questions to Editor Webb (Kibbee). Veteran production designer William Cameron Menzies does a fine job of establishing the film's sense of modified, somewhat distanced reality, with excellent (by 1940 standards) double-exposure and travelling matte work during the film's ending sequence. Famed composer Aaron Copland contributes an effective, unique score, mixing familiar folk tunes and hymns with innovative chord and rhythm structures. The performances are uniformly solid, if a bit overdone to modern eyes, with particularly strong work from Martha Scott during Emily's heart-wrenching final scene. However, it is this same scene that brings me to the film's major flaw: while the movie is generally faithful to Wilder's play, it undermines his most significant point by altering the ending. I don't want to give away any details here—suffice it to say that while the play concludes on a downbeat, contemplative note, the film ends up looking like a Norman Rockwell painting. I admire the play, and I'm man enough to admit Emily's closing monologue always brings me to tears—to see the ending so drastically altered is a disappointment indeed. Image Transfer Review: Our Town is presented in its original 1.33:1 full-frame theatrical aspect ratio. The source print has quite a few scratches, flecks and general signs of deterioration, and it doesn't seem to hold steady in the film gate, moving subtly up and down throughout. The image is grainy and soft, although shadow detail is good (at the expense of contrast to some degree.) The transfer also seems mis-framed, as though it's zoomed in a bit—heads at the top of the screen are cut off in several instances. Most of these issues can be attributed to the source print, and the digital transfer seems solid enough—but the film is clearly in need of restoration. Audio Transfer Review: Unfortunately, Our Town's status as a neglected film seems to have done irreparable damage to its monophonic soundtrack, presented in Dolby Digital 2.0 directed to the center speaker in ProLogic setups. The film was produced in 1940, but here it sounds like an early "talkie," with constant hiss, frequent popping and clicking, heavily clipped speech and a narrow frequency range. Aaron Copland's progressive score often sounds strained and warbly; worse, much of the film's finely-crafted dialogue is downright difficult to understand. If I weren't so familiar with the original script, I'd have had a hard time enduring the film, let alone comprehending or enjoying it. Electronic audio processing and filtering, however artificial, might have helped in this case; as it stands, watching this film will be a frustrating experience for most viewers. At the time of the film's release, Lux Soap Flakes sponsored a radio program featuring one-hour promotional versions of current film releases, generally with the original cast members and musical scores. This condensed presentation of Our Town is introduced by famed Hollywood producer Cecil B. DeMille, and the sound quality is much better than that of the main attraction, though it's obviously dated. It's a bit jarring to hear Narrator Frank Craven pause to reflect on the role of Lux Flakes in Grover's Corners, but this is nicely-produced vintage radio drama and a great addition to this disc. An early sound film by Our Town production designer William Cameron Menzies, featuring creative double-exposure, animation and mechanical effects in this live-action pre-Fantasia telling of the Sorceror's Apprentice, complete with marching brooms synchronized to Dukas' familiar composition. This film is believed to have been the inspiration for Disney's version starring Mickey Mouse, and this rarely seen 1930 short is a fine piece of early fantasy filmmaking in its own right. The print condition is poor, but the film is watchable, and provides some insight into Menzies' pioneering special effects contributions to the industry. A small-town short directed by Josef von Sternberg, filmed in Madison, Indiana with a focus on the shared beliefs and culture of its residents (and by extension, all "good Americans.") The print is a little washed-out, but the fine black-and-white photography is otherwise intact. It's essentially cultural propaganda, but it provides interesting counterpoint to and context for the main attraction. Our Town is a reasonably faithful version of Thornton Wilder's play, marred only by one significant "Hollywood" alteration. FOCUSfilm's DVD suffers from a poor quality source print and some transfer problems, though it supplements the feature with some very worthwhile material. I hesitate to recommend it due to the condition of the film—it's an interesting curiosity if you're familiar with the play, but it might not be the best "first look" at this classic piece of American theatre.